Kendrick Lamar can do no wrong of late. His acclaimed fourth album DAMN., released in April, has topped countless best-of lists (it landed very near the top of Paste’s), and each new music video for a DAMN. track has somehow been more mesmerizing than the last. 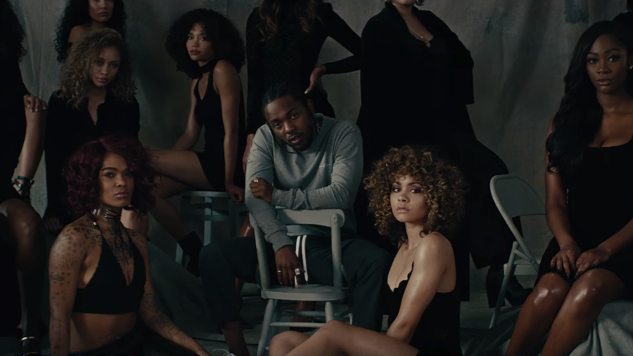 The trend continues with King Kendrick’s visual for “LOVE. (feat. Zacari),” released today. Directed, as usual, by Dave Meyers and The Little Homies (aka Dave Free and Kendrick himself), the “LOVE.” video pieces together shots of a gorgeous sky above a secluded beach, the various stages of a relationship playing out at a kitchen table, and beautiful women dancing and posing seductively. Kendrick’s bright silver hoodie, adorned with the word “LOVELY,” aptly describes both the video and the Zacari vocals that it quotes. This is the fifth video from DAMN., following “LOYALTY.,” “ELEMENT.,” “DNA.” and “HUMBLE.,” all of which are 1000 percent worth watching. The album itself might just be King Kendrick’s crowning achievement—as Carter Shelter wrote in his review, the album “continues one of the most impressive runs of albums of any artist in recent memory.” Long may he reign. Watch the “LOVE.” video below and stream DAMN. here. In June we ranked every Kendrick video—revisit our picks right here.